Japanese Prime Minister Shinzo Abe appears with U.S. President Obama at Joint Base Pearl Harbor Hickam on Tuesday in Honolulu. Abe and Obama made a historic pilgrimage Tuesday to the site where the devastating surprise attack sent America marching into World War II. 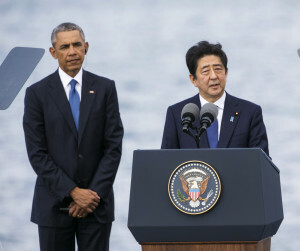 Japanese Prime Minister Shinzo Abe appears with U.S. President Barack Obama at Joint Base Pearl Harbor Hickam on Tuesday in Honolulu. Abe and Obama made a historic pilgrimage Tuesday to the site where the devastating surprise attack sent America marching into World War II.